Home Running Injuries Knee What’s the key treatment for runners with patellofemoral pain? In 2015 Christian Barton and colleagues published an excellent review of conservative management for patellofemoral pain the BJSM (Barton et al. 2015 – open access). This combined level 1 evidence with clinical experience and recommended a multimodal approach, tailored to the individual that emphasises the importance of education and activity modification and includes exercises to strengthen the gluteal and quads muscles. Lack et al. (2015 – open access) also reinforced the importance of including proximal rehabilitation for PFP in their systematic review. Peak muscle load on Gluteus Medius during running is approximately 4 times body weight (Lenhart et al. 2014) and so it makes a great deal of sense to strengthen the gluten for runners with PFP. There are a number of exercises that have been found to target the Glutes, we’ve included a selection of them in our free Glutes Circuit which you can download below. We’ve also written a blog about the evidence and reasoning behind this programme, which you can find here. Click the image below to download our free Glutes Circuit and join our Cutting Edge Clinicians Mailing list. 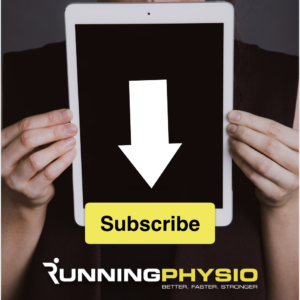 We’ve all just released a series of free videos about achilles tendinopathy. CLICK HERE to find out more. So it seems, based on this research, that education and training modification are key. We’ve discussed this paper in detail on Facebook Live (we get into it from about 1:30 on the video below). Yes, runners were still reporting some pain during running at the end of the program. Since they are group average, some runners reported no more pain in each group, and given the “intention-to-treat” analysis, some runners were considered for their baseline level of pain even at the end because they dropped out. That has to be factored in, even though we didn’t have a whole lot of dropouts. You raise a good point regarding the exercises program. In fact, clinicians were ensuring that participants were reaching a certain level of difficulty so that they would not be able to do a third set for strength exercises. So regardless of their baseline strength, these individuals were challenged during the intervention. That is why different levels of difficulty were suggested to clinicians for the same exercise. Like you mention Tom, I think the main take-home message from this study is that education should represent a primary component of our treatment plan in runners with PFP. Given that running injuries are largely explained by training errors, this makes total sense. That’s a fact: runners tend to overdo and push through pain. Thus, simple advice on training modifications according to symptoms are key. Clinically, my whole approach in injured runners is based on how to appropriately quantify mechanical stress and progress in an individual manner. At the end of the day, our patients may not be part of an RCT, but they still benefit from research out there. Clinically, I rarely only educate people like our “control” arm. I also give them exercises to increase capacity and potentially decrease the risk of recurrence. And if judged necessary (mechanics contributing to persistent pain), then gait retraining is definitely an option. And why not taping, etc. I hope this helps to answer some question. Thanks again for the post! Closing thoughts: As with any study we do need to be aware of the limitations and look to see if results are replicated elsewhere. This research suggests education and activity modification are important and is consistent with the key messages delivered by Barton et al. (2015). Finding what training a runner can manage in terms of symptoms and progressing towards their goals is effective for improving pain and function and should be a key part of what we do for PFP and many other running injuries. As ever though we need to tailor the treatment to each individual and recognise the multifactorial nature of running injury. Find it achilles tendinopathy challenging to treat? See our free video series for information on injury impact, assessment and treatment.